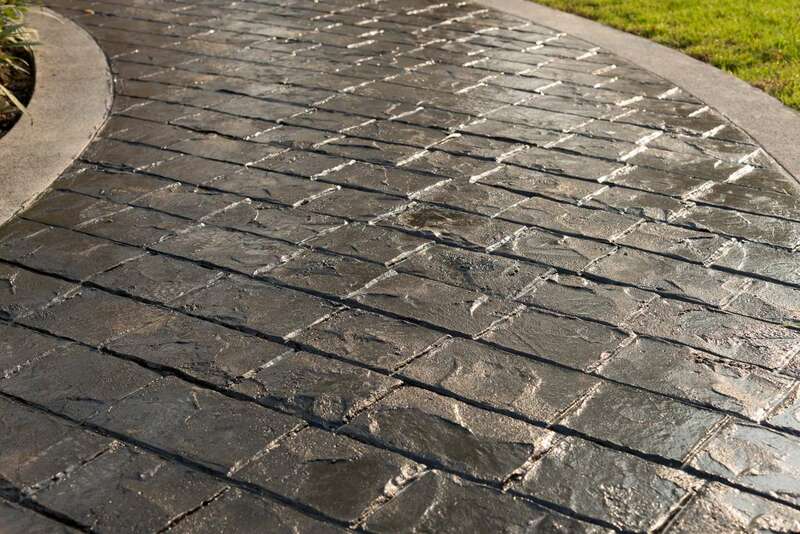 Stamped Concrete is the process of imprinting the concrete using stamping mats or skins. The stamping mats and skins come in a variety of textures and patterns. These patterns can look like brick, stone wood and slate. After the concrete is stamped with a texture or pattern, we then come back and insert expansion cuts to help avoid any noticeable cracking. Decorative cuts can also be made if desired. After the saw cutting, the concrete is then washed, and a high gloss sealer is applied. Stamped concrete with high gloss sealer can become very slippery in wet conditions; we offer additives or a non-gloss penetrating sealer to make the concrete less slippery. These solutions are important when dealing with grades above 4%. Not only can Iron Trident offer multiple different styles of decorative concrete for your driveway. These styles consist of Stamped concrete, exposed concrete, concrete borders, acid stained concrete, float finish or smooth concrete. Iron trident is also experienced with heated concrete slabs, for those colder winter months, and can form a driveway for a garage below grade, or even a driveway for a garage high above grade. Our concrete contractors are very experienced in forming driveways of all sorts. No matter the slope, the shape, the curves, or the decorative concrete finish, Iron Tridents concrete contractors are up to the task. Concrete walls can often time serve either a decorative/architectural purpose or a structural purpose. Iron Trident’s concrete contractors specialize in both. 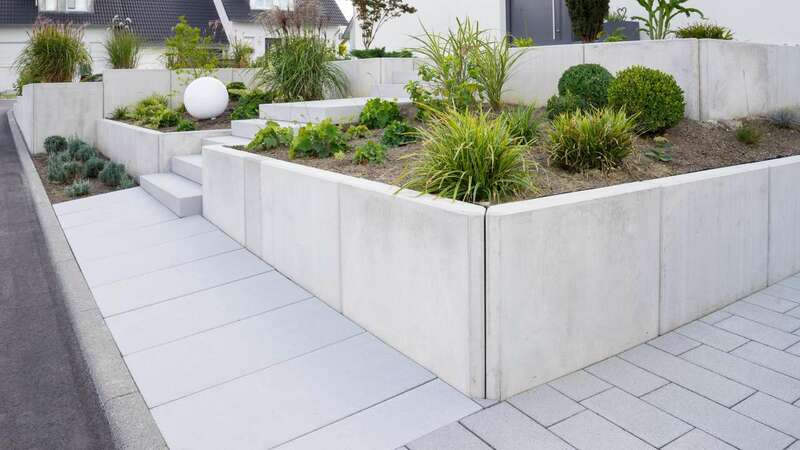 These concrete walls can also be used to form planters, harnessing the luscious greenery/colours of the planter mixing it with a modern concrete finish. We construct our concrete walls with space conduits allowing you to insert sprinkler lines, or electrical lines after the walls have been poured so installation of sprinklers or LED’s can be easily achieved. Our concrete contractors can construct concrete walls of many different finishes, colors and sizes. We often use cam-locks and ties in many of our concrete walls. Cam-locks leave behind a pattern of holes, which are decorative. High gloss sealer may be an option for the exposed aggregate finish; this will allow for a much more vibrant concrete wall. Iron Trident offers a large selection of concrete steps. Consisting of different finishes, sizes, and purposes. Some of our concrete steps are used as landscaping tools to support grade change. 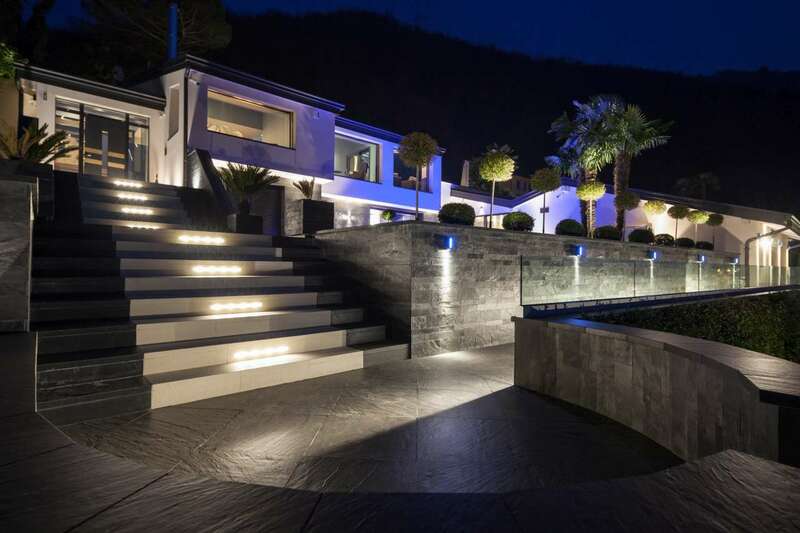 Some of our concrete step designs are used purely as a decorative feature. Each step can be custom designed to satisfy any space limitations if you need to cover a large space with a gradual slope, smaller risers with wider landings might be ideal. If confined by space, more narrow landings might do the job. All of our concrete steps can be designed with any concrete finish. Have you seen our popular contemporary smooth finish concrete steps? We often pour these in the classic concrete gray. These steps can also be paired with light sandblasted borders to truly bring forth the modern contemporary style. As Professional concrete contractors, we always strive to maintain a work-friendly environment for you the customer and our team. We pride ourselves on always keeping a clean, safe and efficient job-site. We are equipped with all of the proper equipment and machinery to accommodate all steps of every project. Along with highly skilled concrete contractors ensuring quality concrete construction projects of all varieties. From simple to highly articulate decorative work, we offer more than just concrete driveways, concrete walls/planters, and concrete steps. We also offer concrete patios and walkways, structural concrete, and a wide selection of decorative finishes for all projects. Along with our decorative expertise, we also have great practices for concrete maintenance and tips for prolonged concrete quality.